For a country with such a rich sports history, you don’t really hear the United Kingdom being associated much with the Winter Olympics. In fact, Michael ‘Eddie the Eagle’ Edwards became the first Brit to represent the country in ski jumping when he qualified under wild card rules for the 1988 Calgary Games. Edwards didn’t fit the typical mold of an Olympic athlete, but he became a media sensation with his quirky, fun-loving attitude. So what if he finished dead last in both events he competed in. If this doesn’t fit the Olympic athlete mold, then I think we need a new master mold! Sure, inline skating became all the rage in the early 90’s, but ice skating and particularly speed skating is a totally different beast. Skater Steven Bradbury was a member of the 1994 Australian speed skating team that took home a bronze medal and in 2002, became the ‘Accidental Gold Medalist‘ advancing to the finals after taking advantage of crashes and disqualifications, then winning on yet another wreck. Australia has since become contenders in the skiing and snowboarding worlds, proving Aussies will do anything that could be classified as risky behaviour. While a matador’s job is to avoid being gored by a bull, Prince Hubertus of Hohenlohe-Langenburg’s mission was to gore his way down the mountain as Mexico’s sole athlete at the 2010 Vancouver Olympics. Sadly, he finished 78th and 46th in his events. He was 51 years old then and competed in 2014 in Sochi, as well, where he was honoured as the country’s flag bearer for the opening ceremonies. Hubertus is the closest I’ve ever found to being like the Dos Equis ‘most interesting man in the world’! 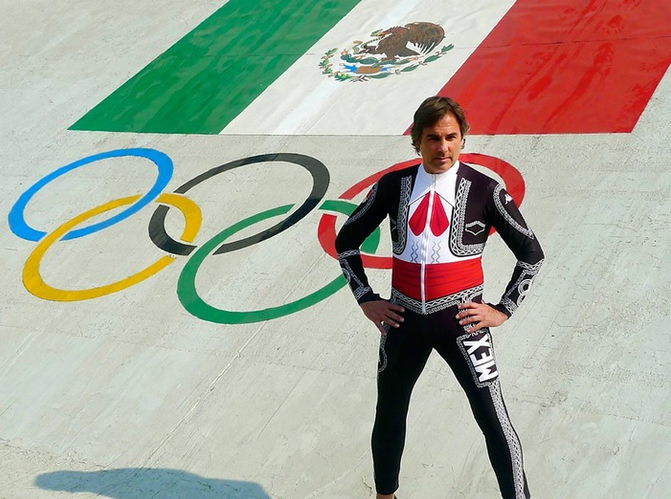 I don’t always ski in the Olympics, but when I do, I dress like a Mariachi performer! With numbers dwindling for nations participating in luge in the 90’s, its overseeing federation started a program to bring in and support athletes from warm weather destinations. Since then, lugers from countries like India, Bermuda, Venezuela, Brazil, Trinidad and Tobago, Mexico, and the Virgin Islands have managed to qualify for the Olympics. This included the father-son Hoegger duo of Venezuela becoming the first father and son to compete at the same Olympics. The movie Cool Runnings was a treasured childhood memory for the Sip Advisor and it’s nice to know that much of the story depicted was true. It’s also wonderful to learn that despite media cracking jokes at the Jamaican’s expense before the 1988 Calgary Olympics, their fellow athletes embraced them, lending them sleds and giving them advice and support. Bobsledder Lascelles Brown eventually won silver and bronze medals as part of the Canadian team, proving things in life always improve when you’re from Canada! With the Sochi Winter Olympics wrapping up this weekend, we tuck amateur sports away for another two and a half years, which is sad. Go out and support your country’s aspiring Olympic athletes… oh, and GO CANADA GO! 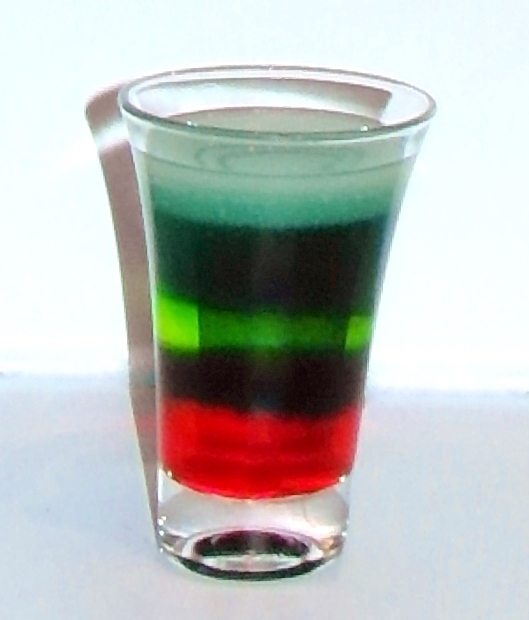 Layer the ingredients in the following order: Grenadine, Cointreau, Midori, Blue Curacao, Lime Juice. Unfortunately, the layering didn’t go as well as I’d hoped it would (it never does), but it wasn’t that bad, either. The blue and black portions were very similar and I hoped that the blue would be… well, a little more blue, but whatevs. Also, the Lime Juice just doesn’t come across as yellow in the photo, like it does in RL (real life). The taste of the shooter wasn’t bad, however.